So when Alaska Seafood offered to send us some fillets (more on that in the coming weeks — with photos!) 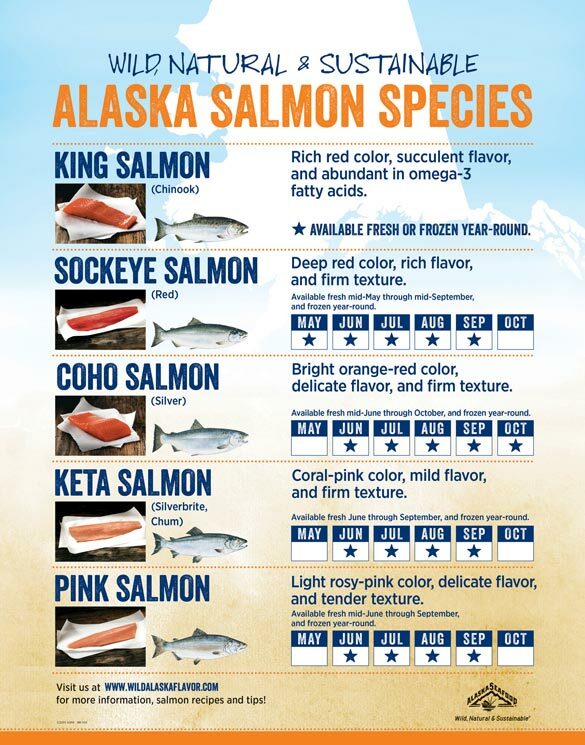 to try along with this handy infographic on the different varieties of Alaska salmon, we were pumped. After all, ’tis the season for wild salmon from Alaska — which accounts for 95 percent of the wild salmon you’ll see in the supermarket. Rich in protein, vitamins, minerals and those amazingly healthy omega-3 fats, bone up on your salmon facts below so that you pick the right kind of salmon for your fit-foodie plate! I’m embarrassed to admit that I didn’t even realize that salmon had a season, like fruits or veggies do. (Learn something new every day!) But now I really can’t wait to cook up some Sockeye and Coho salmon. Deee-licious! Too bad they left out a piece of “white” king. A small percentage of king salmon have white flesh. These are the best of the best. A slightly higher oil content, and but milder flavor.